Some netizens have gone on a witch hunt for others like the Infocomm Development Authority’s applications consultant, Nisha Padmanabhan, who applied for a job with a degree bought from a degree mill. More incidents involving people applying for jobs using “fake” degrees have been dug up, and exposed online. One netizen known by his online moniker, “Albert”, has compiled a list of people who have applied for, and secured jobs in Singapore, supposedly using such degrees. Amongst their employers, Standard Chartered Bank, and BW Offshore Singapore. This comes after the IDA defended their recruitment of Nisha Padmanabhan, despite her possessing a master’s degree which was found to have come from a degree mill. Here are even more cases of people working in Singapore with fake degrees. 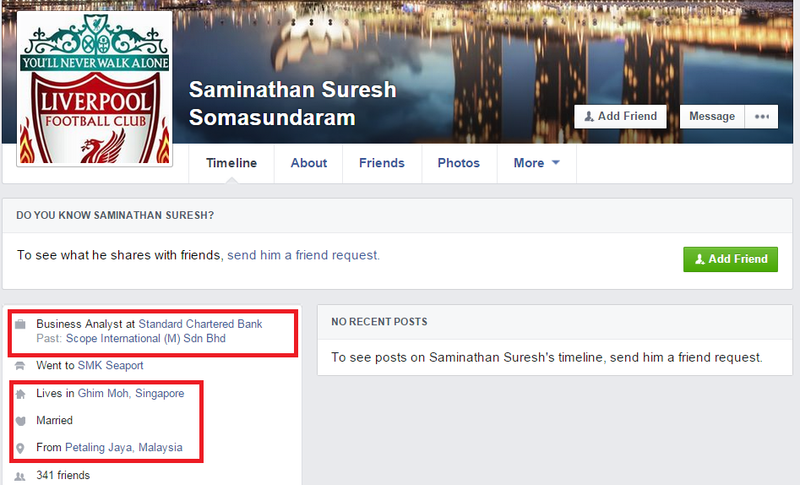 It can be seen that Saminathan Suresh Somasundaram is a Malaysian who completed his secondary school education at Seaport Secondary School in Malaysia. He then proceeded to get a fake bachelor’s degree from Southern Pacific University which is the same degree mill that Nisha from IDA got her master’s degree from. In Saminathan’s case, it is even worse because he was hired despite having a bogus bachelor’s degree. He has no other tertiary qualification. Without even a real bachelor’s degree and any post-secondary qualifications, all he really has are his secondary school qualifications. How on earth is a person with only secondary school qualifications a foreign talent? Furthermore, since he only has secondary school qualifications, how could Standard Chartered Bank employ him as a Business Analyst? 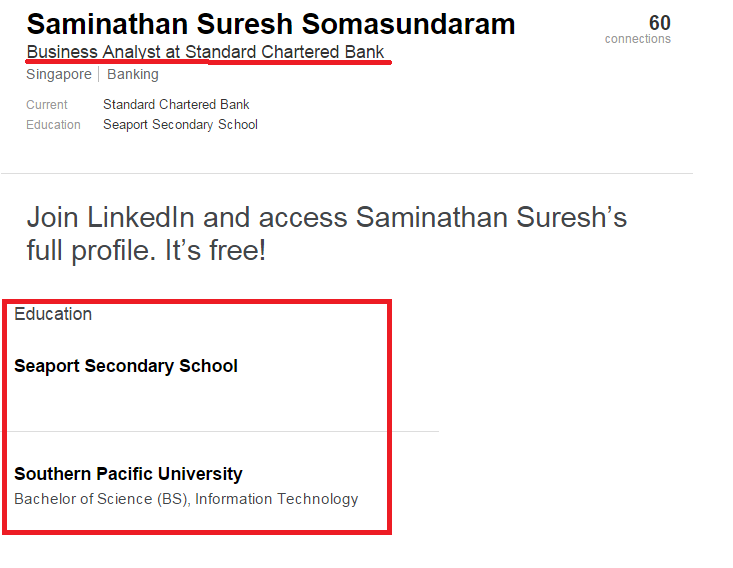 This implies that qualifications are not necessary to get a job at Standard Chartered Bank. I personally would feel very insecure about trusting a bank that does not even have qualified employees. Is Singapore really a meritocracy as the PAP government as always said it was? Or is it a country where different rules apply to different people? I feel angry that because of the PAP government’s liberal foreign labour policies, Singaporeans are losing out at getting jobs, thanks to the foreign cheats. Forumers on this hardwarezone thread have found yet another case. 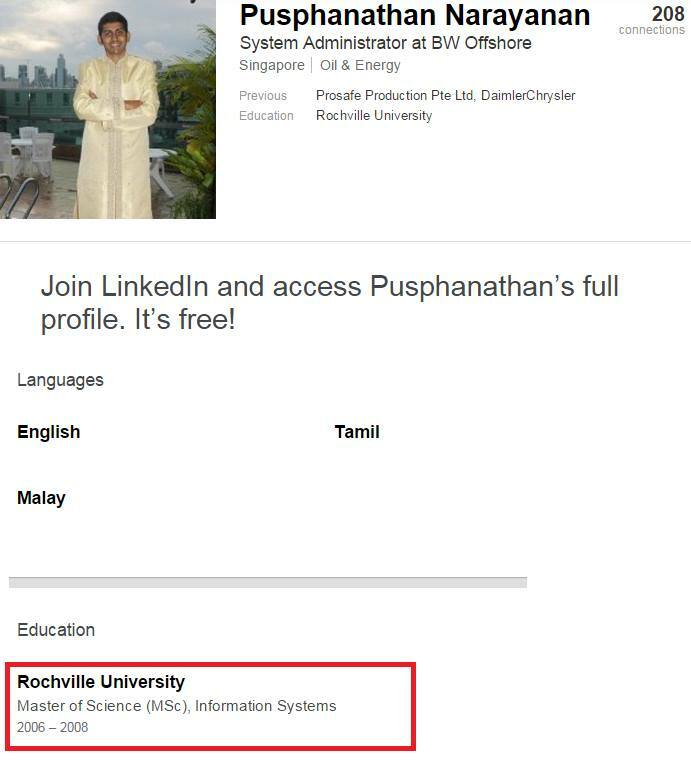 This Malaysian Indian, Pusphanathan Narayanan has a masters’ degree from Rochville University which is a degree mill. Even wikipedia states that it is an unaccredited online university (http://en.wikipedia.org/wiki/Rochville_University). 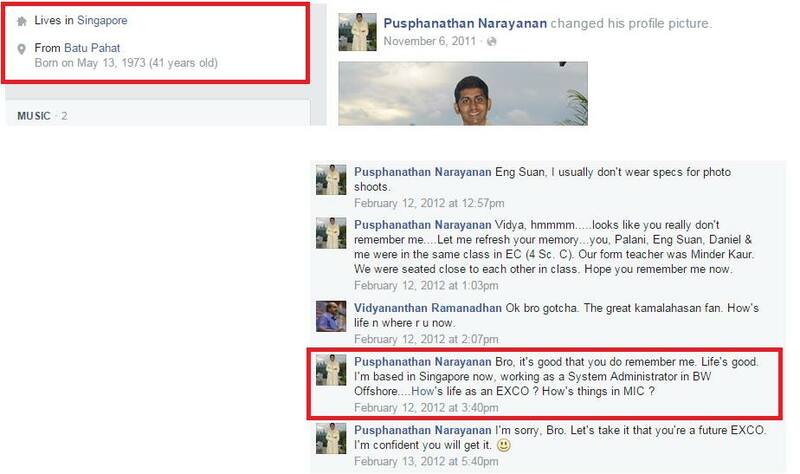 Yet he was hired by BW Offshore Singapore and is working as a System Administrator. He is also living in Singapore and enjoying life right now. On the lowyat forum (A malaysian forum), i saw this thread “Malaysians After Dodgy Degrees, Sought After MBAs and DBAs“. Might explain why the Malaysian Indian got a fake masters’ degree before he came to Singapore to find employment. It seems that foreigners are more clever than locals because they know that they must stand out from the usual degree holders who apply for jobs. So they spend some money to buy a masters’ degree from a degree mill to increase their chances of getting selected. Raffles Education Corporation Limited’s response to the online article above and “Raffles Education Corp Director Lists Multiple Fake Degrees on CV” on TheRealSingapore.com (20 April 2015 at 10.34pm). We would like to highlight that Mr Terence Seet, a Singapore citizen, was employed by us from 5 July 2010 to 18 September 2013 as a College Director with Educomp-Raffles Higher Education Limited in Chennai, a joint venture between Educomp Solutions Limited and Raffles Education Corporation Limited. He did not hold any teaching position. At the time of Terence’s application for employment as College Director, we had in good faith relied on his purported qualifications and especially his 16 years of relevant working experience, and two supporting references from his previous reputable employers. We had initiated an investigation to validate Terence’s qualifications after he addressed himself with a professional title of “Dr.” when dealing with people outside of our company. The investigation revealed that Terence’s doctorate was from a degree mill. In consequence thereof, Terence was asked to resign with immediate effect in September 2013 and which act is in conformity with the established practice of our company. We take a serious view of this case. Further, the qualifications, suitability and integrity of all our staff (whether academic or administrative) are of critical importance to us. The fact of the matter is we were the one who had found out that Terence’s qualifications were not genuine and had immediately taken action on the matter the moment the truth was established.